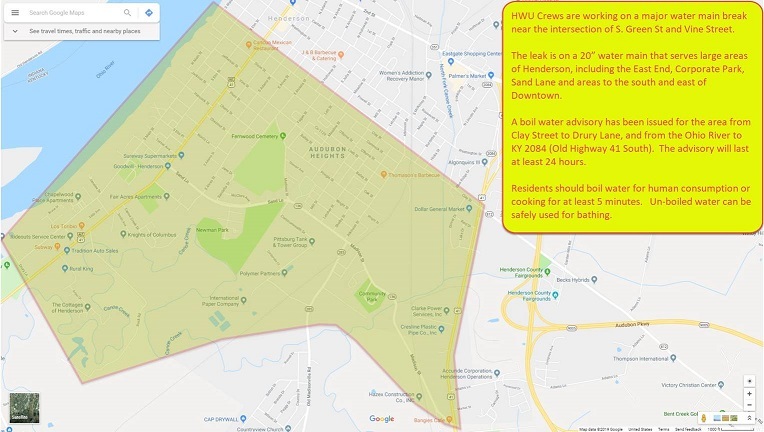 A boil advisory has been issued for some parts of Henderson. Monday, Henderson Water Utility crews are on scene at the intersection of S. Green and Vine Street for a major water main break. The 20″ water main serves large areas of Henderson, including East End, Corporate Park, Sand Lane and areas to the south and east of Downtown. 44News is told the section of the leaking water main was completely isolated, and pressure was quickly restored in the water system. However, due to a pressure drop in some areas, a boil advisory was issued for the affected areas. Residents are advised to boil their water for human consumption or cooking for at least 5 minutes. Unboiled water can be safely used for bathing.